Time to find that special beagle for you. I strongly suggest that you DO NOT go to a pet store. Many of these puppies are bought from puppy mills and purchasing animals from these stores just supports a system of neglect and abuse from the first first moments of a puppy's life. I would not buy a puppy from a backyard breeder and would check to make sure it was registered with AKC. There are many kennel clubs in the USA that will "register a beagle" so be careful (please read link). Start by contacting your local kennel club; ask for information concerning breeders in your area. Call theses people, ask questions, go to see their dogs. Reputable breeders will ask as many questions of you as you should ask of them. Breeders should take lifetime responsibility for their dogs. 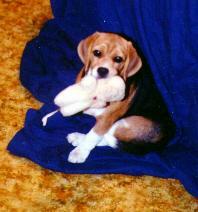 Ask for references from people that have purchased beagles from them previously. Do they provide a written contract? Local newspaper ads may lead you to a good breeder, but be very careful, they could also lead you to backyard breeders (see link above). Make sure that the breeder has researched the pedigree and potential genetic health problems in beagles. Many people just take a male and female and breed them without concern for what the puppies may or may not inherit. You should expect a high standard of responsibility from the breeder. 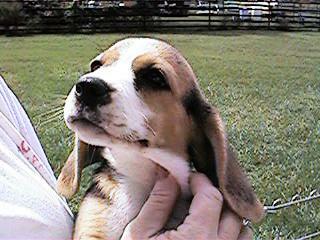 You can also contact the National Beagle Club's contact person for information about breeders in your area. Write or phone Julie Fulkerson, 2781 Wheat Rd. Lenoir, TN 37771, (865)986-9406. Most reputable breeders have a waiting list, so start early looking for your beagle. Also, most reputable breeders will not just give you a pick of the litter for a pet. Usually they have show homes waiting and you may not be the first on their "pet" list. I try to match the right puppy to right home. An example of this is: I have two puppies-one that is always getting into things and very curious. The other puppy is happy to sit on couch and watch tv with me. I have two homes,,one is a retired couple that travel in the motorhome and the other a family with three kids. Which puppy should go to which home? The couch potato should go to the retired couple and the active puppy to the home with kids! A good breeder knows the personality of their puppies and wants to make sure the home is right for the puppy and the puppy right for the home. Bringing a new beagle home takes preparation and ongoing adaptation to the changes it brings. Below are a few articles that I suggest you read about care of your new beagle and how to keep them safe. "Dogs are not our whole life, but they make our lives whole." --Roger Caras Links to more information about puppies,finding a reputable breeder, and responsible ownership.